» Forum » Tech » Tech: Modern games » How can a coil not work in test mode but does in game? » How can a coil not work in test mode but does in game? How can a coil not work in test mode but does in game? Have a left orbit gate coil that will not fire in test mode but will in the game. Although the gate does seem very inconsistent on when it works and when it doesn't? How is possible? Thanks all! It's on a fish tales and don't think it even if has interlock on coin door. And all other coils fire fine. This is an interlock switch. An interlock switch should be present on all factory FTs unless missing, bypassed, or hacked. All high power coils on FT are tied to this switch for high voltage power (+50 V) including flippers for WPC (Fliptronics 2) era 1992-1993 games. There are number of reasons tied to MPU operation that can cause a coil to be untestable including while the interlock is properly active or disengaged (meaning normal operation), but there was no detail provided to determine any source of what was conducted prior in diagnostics, but I did understand what you were asking. What you described is the left orbit gate assembly (A-14422) (Coil #6) which is lifted via relay coil (A-14406). This is a "high power" not "low power" coil under the +50 vdc line. Misalignment, broken parts, or bad spring can all cause this effect. It is mostly needs to be rebuilt, the actuator plate is either too far away from the coil to properly magnetize, the plate is overly magnetized, the actuator plate and tab is broken, or the tension actuator spring needs replaced. These are your areas to investigate. You should hear the tab "clicking" on test, when the interlock switch is in the forward position (high voltage engaged), or if the interlock switch has been replaced with a type 2 interlock, you can "pull" it out, thereby engaging the high power. If you have no interlock, there are other issues with your game that also need to be fixed. The coil #6 actuator tab should "click" regardless if the playfield is up or down. If the one way gate is failing to fully rise when the coil engages while "clicking", you need to inspect the parts closely. If it is not "clicking" at all, the plate is not engaging reliably on release reset. Remember this test is momentary not a prolonged "hold" like a flipper coil. Be mindful, when the high power is engaged in order to avoid electrocuting yourself, or shorting out your game as this is a "hot test" requirement to see what is actually going on as this coil is in the corner and harder to see and reach. Thank you. So, I have the switch present and it is wired up but must not function correctly. NONE of coils are disabled when the coin door is open and the button fully extended. Thoughts on how to troubleshoot fix? The button registers correctly in switch test mode. Replaced both springs. Will double check that I used the correct spring. Tested voltage to coil and it read 75V. Coil is brand new and resistance checked out. Thank you for this level of detail. Definitely no clicking or any visible movement going on in coil test mode and other coils on the +50 VDC line fire just fine. Going to double check the mechanics you described above. Have had other pinsiders suggest it could possibly be a bad ribbon cable or a bad PIA 40 pin 6821? Thoughts on these theories? Little pinside donation on your behalf for taking the time to write this. That is a memory protect switch. Note there is only one switch in your picture. FTs were made before Williams started adding the high power interlock switches. Which started probably 6 to 8 months later during the last third of TZs production. I have an mystery anomaly on my game. This is strange or at least odd to say the least. I have another full double interlock on the inside of my FT coin door panel on the left side as well (toggle throw) right outside photo with the diagnostics buttons, which visibly disengages the high power on the game (and actually activates with programming code). Essentially two sets of interlocks, even if the top door one is memory only. I did not install or retrofit either of those switches since I bought the game (I believe in 2002)? This is something I failed to mention in my first posting, but should have. I thought they were tied together, but it looks like I was wrong. My FT game was built in very early October 1992, and is not a sample or prototype that I could tell and serial numbers match across the game. On my Doctor Who (granted this is a second sample version "Wobble head" game before the first production 100-150 or so of the factory with the "Wobble Head") I have both the standard double interlock with toggle (inside door only), and of the course the extra safety microswitch that is used when the glass is off to protect against the famous mini-playfield "pinched fingers" problem. This game was built even earlier in August 1992, and the interlock looks like standard safety version. Was WMS playing around with the concept earlier than anticipated back in mid 1992? My TZ of course has one, but this was a late run production overstock which I bought in 1994. What I am confused about is if WMS introduced these as standard in April 1993 (or thereabouts) with TZ why does my FT have an interlock with code? Which was the first game that really used them? How many previous titles to TZ used them? Were there test games that used this feature before production? I probably need to investigate the rest of my games of the era to start doing some detective work here. I know my T2 does not have an high power interlock only memory. I do not think I have any other early sample or test games of the era, as most of my others are production standard, other than my prototype RS which is outside the range of start of the safety feature. No idea when code was written in. I never heard of it being in test or prototype games either prior to TZ. My understanding has always been the first 1/3rd of TZs didn't have it, the middle 1/3rd did have it but not wired in, and the last 1/3rd had it and was wired in. And the memory protect switch triggers the alert that coin door is open and high power is off, not the high power interlock switch, which does nothing but kill high power. Yes, but since Doctor Who was produced nearly the same time as Fish Tales in 1992, and the safety code was standard on production games of this title (with WARNING animation and sound), were production models on Doctor Who only using the micro switch near the playfield glass to disengage high power not an interlock? I know this is hypothetical, and my DW is unique anyway, and may not be a good baseline example. 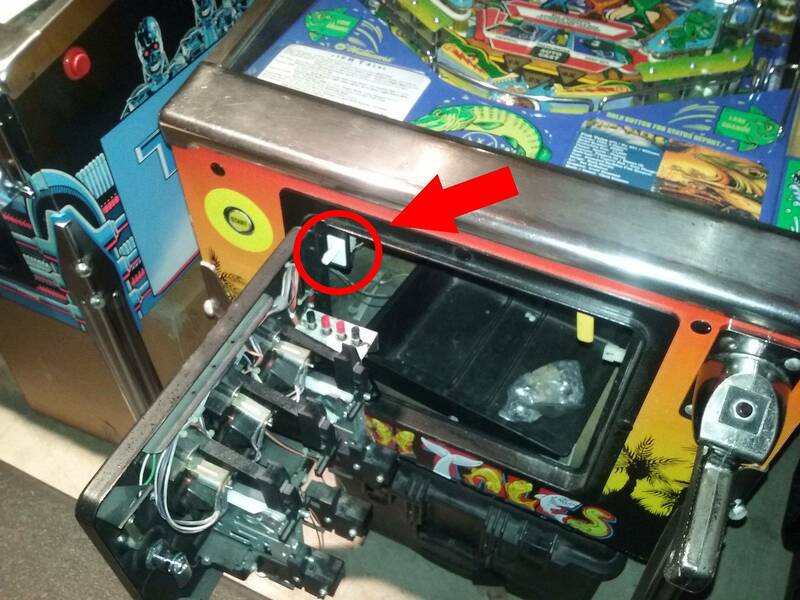 If I tape down the upper microswitch on my game, but not pull the toggle interlock inside the coin door, the high power is will not engage (or alternately the coin door is closed). I have to do both or I cannot test high power functions including the mini-playfield, and it is factory wired no operator hacking. This game came from a WMS factory employee. Well at this point, I just want to see photos of the OPs game and figure out what happens on the DMD screen when he opens the coin door, which is probably nothing, it just stays in game over mode. 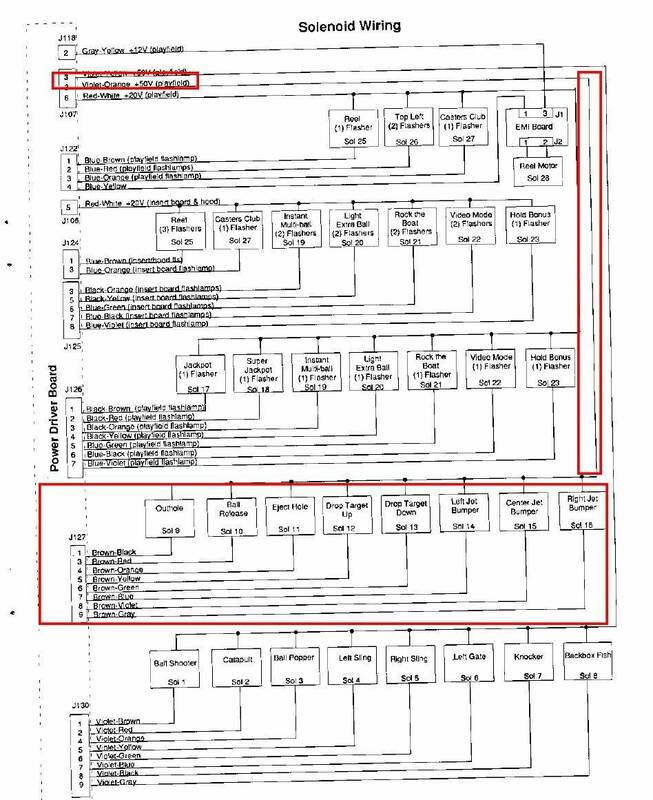 One problem is basically not really an issue and eliminated, so we are back to the physical assembly, wiring (coil, IDC, and ribbon) , pre drivers, components, coil, transistor, or logic ICs at worst for the left orbit. The glass switch/coin door on Dr who only disables the mini pf motor. Not the coils. Try re-seating the ribbon cable, I've had this happen before. I will explain the relevancy regarding my question again for the purposes of pinball history only and the question. The whole discussion was not understood by other readers. As I already previously stated, my Doctor Who is NOT a factory production model and does not operate in the same manner nor have the same wiring, it is a second generation sample prototype (unknown quantity built) that was created after the tall backbox version (Only 2 remaining to my knowledge) as most were scrapped at the factory with the holographic lithograph. People may not realize there were actually FOUR different types of Doctor Who games made. It has relevancy in the wiring design here, based on determinations of what was occurring at the factory at the time for game code and feature development INCLUDING the interlock safety switch. The first DW model was the prototype WPC game with the tall head (EATPM, Transporter, Black Rose, etc). This was a throwback to the Bally System 11B period. This is when BLY/WMS did the redesign of the artwork on the translite and compress the backbox image. This was also the primary design test game, not the original prototype. The third DW model game was the early WPC production models with Wobble head functionally remaining only before they removed it for cost cutting reasons. The fourth DW model game was the WPC production game. In my SPECIFIC case, if I engage the coin door toggle switch and the glass switch, my high power is completed disengaged and cut off. ALL high power (+50 vdc) coils, not just the mini-PF. I do not receive any different notification on screen on this game that the standard programmed warnings of production models. "Not all games are created the same, if you know where to look." Production models of Doctor Who disengaged the mini-playfield only to my knowledge, as LTG stated based on the timing of the PROPER introduction of the interlock safety switch and advent of the added code, which makes sense following the WMS timeline. This is why this discussion pursued, as I do not know when WMS actually started using the interlock as a safety feature. I do not know if I have another "transition" period feature game of the WPC era, like I do with my FT which I clearly do. We probably will never know at this point, as this is another advent that may be lost to time, and the only way can know is based on other potential prototypes and samples that were tested at the factory in 1992. If owners have DW/FT prototypes, this would be a good place to start being able to learn as this is the right period. OP, I'm not that familiar with FT, is there a switch that triggers the gate during game play? Normally you would see the opposite problem, in that the solenoid works in test, but not game play. If a switch triggers the coil during game play then it's possible it is sending a longer pulse than what is done by the computer during test. Even if the gate is CPU controlled it is still possible that a longer pulse is sent in game play than in test. Other than that I can't think of any differences between the two scenarios. If it is an issue of the pulse length then you likely have a high-resistance connection somewhere between the cpu and the solenoid. So start at the cpu and check every connector and solder joint for a bad connection/joint. This would also explain why the gate is not acting consistently during game play. Lloyd had mentioned this as well. Going to try and replace it with different cable as well. Thanks! Forgot to answer that the gate is controlled by the right orbit roll over switch. Do you happen to have photos available of these two versions? A photo of the mysterious interlock switch would be great too. P.S. - OP, glad to hear you got it working. And the alert on the DMD. Anybody can add an interlock switch. Try adding the alert on the DMD. I don't doubt xTheBlackKnightx , just like to see it archived for future reference. And while you are making pictures of the proto FishTales, can you check if the low power solenoids are indeed on the 20Volt. I've never seen that on any WPC machine. And while you are making pictures of the proto FishTales, can you check if the low power solenoids are indeed on the 20Volt. I've never seen that on any WPC machine. I agree. According to the schematics they're on 50 volts. 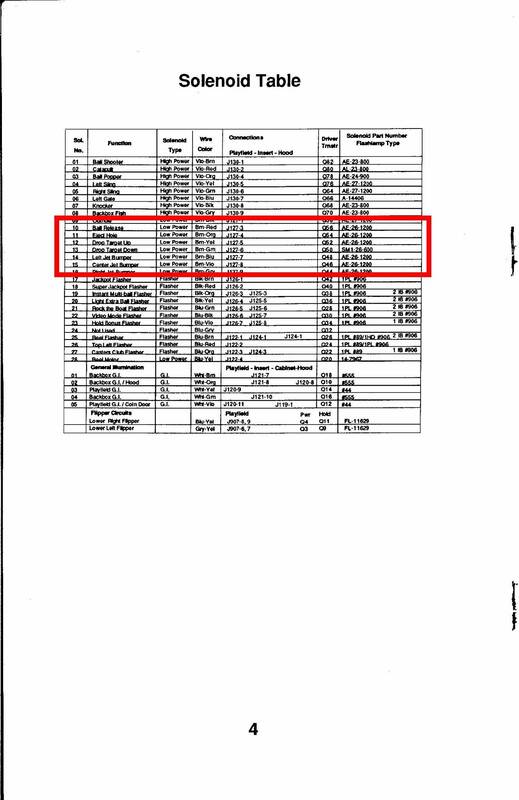 I did not fully cross check the entire manual between category solenoid list and actual schematics. Standard +50 vdc on J127 IDC PDB line. This needs to be a different completely thread. I think I started to discuss this on another DW thread, but just moved on. There is a whole story beyond was initially provided by "The Pfutz". I was trying to find better high quality images out of my archives of the first and second versions of the DW models before it went into production. Either through the WMS factory, on location, or collectors. 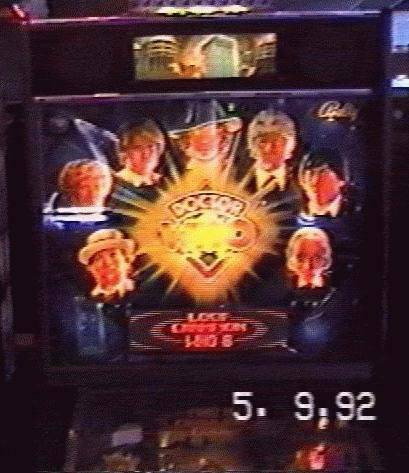 This image from 1992 nearly Chicago includes the working Dalek topper, magic motion holographic lithography (doctor emerges from TARDIS and Daleks are shooting), original concept translite, and Bally cabinet style of the FIRST prototype design. The original Bally game used the translite photo faces versus characteratures that "lit up" to notify players which doctors were selected since the DMD light board did not exist yet. Additional flashers were used to enhance the effect. There were also some cabinet artwork differences. This earliest example was actually first constructed in early 1992. VERY VERY RARE game for those that still exist, which I only know of two. It is not even listed in price guides. For those not aware, the game license was captured for the 25th DW Anniversary. WMS did a VERY short run of testing before it was pulled back to the factory as they were toying with the concept between August-September 1992 of the design specifications between the first two versions. The second version still had the Bally translite on some games, which they lopped off the bottom part to make it fit the WMS cabinet with the speaker panel. This second version also went out for testing for about a month or so. Good to see the OP found the physical FT combination problem.